Sport HD Base Tray is designed as a universal light mounting system. The foam cushioned handle with tripod mount screw fits Intova SP1 and other popular cameras with housings. The top of the handle has an adapter for either flex or ball arm systems. Anodized aluminium construction for light weight and durability. Dimensions (5.5×5.5×1.6) inches/(14x14x4)cm, weight 5.4 oz/153g. 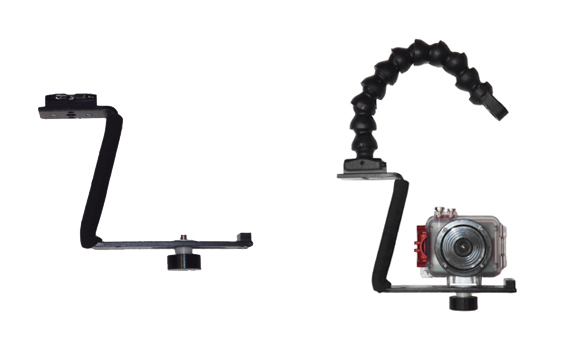 Also shown assembled with Sport HD camera and FA18 flex arm (sold separately).